You are here: Home » MEDIA » Books » Dead Water And Other Weird Tales by David A. Sutton (book review). David Sutton has been writing horror fiction since the 1960s. Over the decades, many of his stories have appeared in a multitude of anthologies. Furthermore, he has won many awards for his editing on fantasy anthologies. 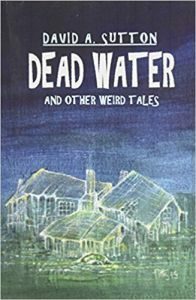 However, this reviewer is given to understand that ‘Dead Water And Other Weird Tales’ is the first time a complete volume of Sutton’s stories have been collected together in the same place and it does seem about time. ‘Dead Water’ contains some 18 stories selected from Sutton’s career between 1976 and 2015. The book is reasonably well produced with a spooky illustration by Jim Pitts. The cover has a slightly odd matt texture which, although not uncomfortable, I found slightly odd. I suppose this fits the writing as Sutton does not go in for gross-out body horror or gore but instead prefers a more psychologically odd narrative. When I read these stories, I was reminded of the ‘Tales Of The Unexpected’ by Roald Dahl. They have the same kind of fantastic weird in an everyday setting sort of feeling. After an introduction penned by David Riley, the stories are arranged in no particular order. The only tale from the 70s is ‘The Fetch’. This story of urban witchcraft was for me the most disappointing and felt rather conventional. Maybe it is just less skilful as it is an earlier example of Sutton’s writing. In the 80s, Sutton has brought us five stories. ‘Return To The Runes’ is a slightly sinister tale of family betrayal in a haunted abbey, but this tales has not stuck with me. ‘Corruption’ is the closest Sutton comes to gross-out horror in these tales and contained some striking imagery. However, I am not convinced the biological detail is correct. ‘Waking’ is an efficient tale of involuntary body hopping which was well-crafted but did not stand out very well in the volume. ‘The Transmigration’ is a dreamy tale of African black magic with a strong other-worldly sense. This tale stood out as one of the better ones for me due to its generating a more effective horror atmosphere. The decade closed on a high point with ‘Under The Glamour’. This is a thoroughly enjoyable tale of mass hysteria at the end of the world, but feels more like psychological science fiction than horror. Moving onto the 90s, we have ‘Innsmouth Gold’ which is Sutton’s sole contribution to the Cthulhu mythos fiction in this volume, anyway. It is an effective tale of Innsmouth’s inhabitants in later years and the unfortunate soul who disturbs them. Good stuff. The other tale from the 90s is ‘Midwinter’ which is more of a fantasy tale, being Arthurian. It is an effective tale but stands out as not maybe quite fitting with the other stories. The first decade of the new millennium provides five of Sutton’s tales. ‘Zulu’s War’ is a less conventional tale of wartime horror and the syndromes that can arise from such. It feels, as I believe it was intended, a very contemporary tale of our times and feels like it has great relevance today. ‘The Fisherman’ is the opening tale in the volume and one of those that feels much like ‘Tales Of The Unexpected’. It describes a close encounter a young couple have with a weird haunted fisherman searching for his drowned wife. This tale contains some nice haunting imagery as the young lady becomes obsessed with him. ‘Mind-Forged Manacles’ is a Science Fiction tale of environmental collapse and a seductive nature mother. It works quite well as weird SF, but it doesn’t feel very horrifying. ‘Gifts’ is a short Christmas themed story that features a different take on Santa. As such, it was almost humorous and it felt a bit out of place. ‘Dead Water’ is the title story and is a very effective tale of a different kind of monster. This is all the more horrifying because it feels…plausible. Most effective! Five more stories bring us up to date, with the last two being new to this volume. ‘A Night At The Hippo’ takes advantage of the sinister feeling some of us get from ventriloquists. This is a very effective tale of variety acts being more than what they seem. ‘Night Soil Man’ is Sutton’s contribution to the Jack The Ripper mythology and is a short and flavoursome tale that keeps the reader guessing to the end. ‘The Pre-Raphaelite Picture’ is a fun tale of a man fallen in love with a woman in a picture. Will he be able to join her despite the efforts of his psychic debunker friend? New to this volume we have ‘Pot de Téte’ which is a terrific tale of voodoo in the Dominican Republic. The description is skilful in this story and so the cloud forest is effectively evoked as a deep and mysterious place. The actions of a houngan in the late 1800s prove that superstition might be more than just that. This is a highlight of the volume. Also new is ‘Landfall On Elysium Planitia’ which is an effective combination of horror and Science Fiction and one of the most effective stories in the book and so it is great way to end the volume. It essentially concerns a mission to Mars that gets some truly bad news, after which the horror starts. It feels as if the reader can see the increase in Sutton’s skill as the decades passed. I felt the earlier stories were the least impressive and they probably won’t stay with me. By contrast, the later ones are the ones I shall remember. Certainly ‘The Fetch’ and ‘Return To The Runes’ are the least accomplished tales, while ‘Pot de Téte’ and ‘Landfall On Elysium Planitia’ really stand out to me. Tales like ‘Gifts’, ‘Under The Glamour’, ‘Midwinter’ and ‘Mind-Forged Manacles’ clearly show the breadth of Sutton’s writing but while they are all good curiosities they don’t feel as if they belong in this volume. ‘Zulu’s War’ shows how serious Sutton can be. ‘The Fisherman’, ‘Dead Water’ and ‘A Night At The Hippo’ are all great tales. ‘Innsmouth Gold’ and ‘Night Soil Man’ are both genre tales. In fact, there seems to be something for everyone in here but I don’t think everything will appeal to everyone just as not all the stories have appealed to me. « IDW Returns To WonderCon 2017.